Paula Hawkins' Into the Water (Black Swan) has claimed a second week at number one in the UK Official Top 50, selling 33,362 copies in paperback—a 37% bump in volume on the week before. Pan Macmillan, Bloomsbury, Orion and Penguin Random House all have titles in the running for W H Smith's Thumping Good Read Award, which is back after 15 years. The Nobel Prize in Literature may not be awarded in 2019 unless trust is restored in the Swedish Academy which administers the prize, the Nobel Foundation’s executive director Lars Heikensten has said. Tana French, award-winning author of the Dublin Murder Squad series, has moved from Hodder to Viking for a standalone novel. Isobel Richardson has joined Penguin Ventures as head of brand management from Warner Bros Kids and Family Entertainment division. Independent children’s publisher Imagine That, formerly known as Top That Publishing, has hired several former Bonnier employees, including Ross Taylor. HQ will publish two more books from Avon commissioning editor Phoebe Morgan, including a “gripping” psychological thriller about a dark secret hidden by a wife from her husband. Further to our news brief about Sarah Crichton leaving FSG at the end of the year to pursue other opportunities, when we queried the publisher about it last week they said there was no announcement. Now they have issued a statement, in which FSG publisher and president Jonathan Galassi says, "With her unique blend of enthusiasm, discernment and publishing talent, Sarah has been a beloved and energizing presence at FSG. She will be missed." Crichton adds, "My almost-fifteen year run at FSG has been a joy. I am leaving with great fondness for my colleagues, my wonderful authors and their splendid books. This has been one of the most exciting and rewarding chapters in my life. I look forward to discovering what the next chapter holds." The imprint itself will continue to publish books though December 2019. Elsewhere,Juan Milà Valcárcel has joined the Harper One group as executive editor, based in New York and reporting to Judith Curr, responsible for building the fiction list as the group "expands beyond its eponymous imprint. He was at Salamandra in Spain for the past 13 years. Valcárcel will be hire a senior editor, and he will also acquire Spanish-language titles, in coordination with the team at Harper Iberica, and others. Sarah Lazin Books will become part of Aevitas Creative Management, and Sarah Lazin will become an agent with Aevitas, starting June 1. Also former managing editor of Time magazine (and recently a contributing editor to Vanity Fair) Jim Kelly has joined Aevitas as an agent. Jennifer Abel Kovitz has been promoted to vice president and associate publisher, sales & marketing at Catapult/Counterpoint/Soft Skull. Bill O'Brien has joined Outsell as director of business development. He was director of development at Copyright Clearance Center, where he worked for almost 13 years. Ashley Towne will move up to director of the Journals division at the University of Chicago Press as of June 1. Most recently, she was interim director and publishing operations manager in that division. London Book & Screen Week has announced a US version of their Creativity Across Media: Entertainment and Originality Awards, opening for entries in September 2018. They will give awards for book to film; book to game; book to stage; book to TV; and book to audio. Lunchtime Event | Scoundrels & Eccentrics of the Pacific by John Dunmore | Thursday 14th June, 12-12:45pm. Unity Books, Wellington. Come and hear author John Dunmore, author of Scoundrels & Eccentrics of the Pacific, in conversation with Lydia Wevers. 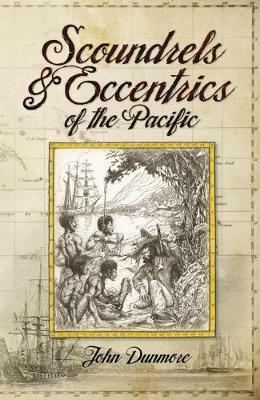 Scoundrels & Eccentrics of the Pacific is a collection of tales of the men, and in some cases the women, who sought to benefit from the discoveries of the early explorers. They were mostly scoundrels and rogues with little conscience but great craftiness, and they left in their wake others who found themselves victims of unimaginable situations. Here are the adventurers who once made the great Pacific their playground — from likeable dreamers to outright con-men, slavers and pirates, and even one self-titled Queen Emma. There’s the extraordinary tale of James Proctor who used his wooden leg to trick natives into coming aboard his ship so he could spirit them away as slaves; or the French priest Fr Rougier who used his position to amass a fortune, eventually becoming the ‘King of Christmas Island’. Along with rollicking tales of the outrageous and bizarre, there are gloomy accounts of those fallen prey to human trafficking, goldfield fever and unscrupulous traders. Authors Defend W.H. Smith: British authors have waded in to defend the retailer after it was named the worst shop on the U.K. High Street this weekend. Lit Agency Embezzled for $3.4 Million: A Manhattan accountant cooked the books at Donadio & Olson, leaving the company on the brink of bankruptcy. A Book Wrapped in Intrigue: The co-author of the book 'The Spy Chronicles,' a former Pakistani intelligence chief, is facing an inquiry over the book from his Indian counterpart. Rita Dove, 'NYT Mag' Poetry Editor: The newly-hired Dove discusses what value poetry might grant unsuspecting news readers. Adichie Comes to Terms With Global Fame: As Chimamanda Ngozi Adichie's subjects have expanded, her audience has, too—but visibility has its drawbacks. Authors have waded in to defend W H Smith after the retailer was named the worst shop on the UK high street. George Saunders, Hilary Mantel and Michael Ondaatje are among the names to have been shortlisted for the Golden Man Booker Prize, created to celebrate the 50th anniversary of the coveted literary award. Alex Bowler's "fine and curious mind", and the mix of skills he brought from his previous roles at both Jonathan Cape and Granta, together won him the coveted Faber publisher post, chief executive Stephen Page has said. Blinkist, a tech start-up that boils down key ideas from non-fiction books in short-form text and audio for users—without publishers’ permission—is planning a UK expansion. W H Smith has been offering customers money back if they find a cheaper copy of one of their books at a local rival bookshop. Singer songwriter Ed Sheeran is the next subject of celebrity biographer Sean Smith, in a deal for HarperNonFiction. Mick Herron's lauded espionage thriller Spook Street (John Murray), already a CWA Ian Fleming Steel Dagger winner, has now also been shortlisted for the Theakston Old Peculier Crime Novel of the Year (£3,000). Sarah Odedina, editor-at-large at Pushkin Children’s, has acquired two manuscripts after the latest round of open submissions. The Society of Authors is calling for tax relief to be extended to writers undertaking training for new skills in response to a government consultation. Stripes Publishing, an imprint of the Little Tiger Group, has acquired a magical rhyming series by Michelle Harrison.